WheelWOD use a version established guidelines presented by International Paralympic Committee. If you do not fit these categories you can by email request a specific classification review. The first step in disability sport classification is to determine if the athlete has an eligible impairment. The Paralympic Movement offers sport opportunities for athletes that have an impairment that belongs to one of the ten eligible impairment types. We are going to be using these guide lines along with the CrossFit 10 physical domains to make your assesment. WheelWOD will accept all physical impairment types that fall into the categories above. The presence and permanency of one of the sport’s eligible impairments is a prerequisite to participate, but not the sole criterion. Does your impairment significantly affect 1 or more of the CrossFit identified 10 general physical skills? If the answer is yes then you probably qualify and can submit a request for review from our committee. 1.01 – The WheelWOD open is a series of 5 weeks of workouts, with workouts workoutS released at once, over 7 days to complete. WheelWOD.com will create Adapted work outs for Seated Athletes and release them April 22nd on competitioncorner.net and wheelwod.com. Athletes must complete each workout and have their score recorded and validated to be ranked and eligible to qualify for the summer championships in July 8-10/ 2016. The top qualifying 9 athletes in men’s Rx and 4 in the Women’s Rx in the Qualifiers are invited to WheelWod Championships. All 3 workouts are released on Friday April 22nd 2016 at 12:00pm EST and Athletes will have until the following Friday April 29th 2016 at 12 p.m. EST to complete the workouts and submit a score. Once the workout closes at 12 p.m. EST , athletes will not be able to adjust or submit a score for the qualifying workouts. Precise start and end dates for the Qualifiers are be announced on the Competition Corner Website. The 2016 WheelWOD Qualifiers registration will commence on Monday, April. 4, at 6 a.m. EST. The 2016 registration will close on Thursday, April 28, at 12 p.m. EST. 1.02 – INDIVIDUAL ATHLETES Any athlete meeting WheelWOD’s age requirements may register to compete in the Qualifier, as an individual athlete. WheelWOD reserves the exclusive right to allow or deny the participation of any athlete. WheelWOD also reserves the exclusive right to validate or invalidate any athlete’s scores submitted as an individual competitor. WheelWOD will make such participation and scoring decisions to preserve the integrity of the competition. WheelWOD TM. reserves the right, in its sole and absolute discretion, to invite guest athletes or others to participate in any stage of the competition. 1.03 – Qualifier REGISTRATION Every athlete, whether competing individually must register online at www.wheelwod.com For step-by-step instructions on registering for the Open, please go to the FAQ page at www.competitioncorner.net and click on the “REGISTRATION” tab. 1.04 – Qualifier REGISTRATION – Competition Corner Account- Each athlete must have a Competition corner account in order to compete in the competition. Creating an a account only needs to be done once. Athletes will use the same Competition Corner account each year. Athletes will use their account for registering, submitting scores, tracking workout submission and validation deadlines, and reviewing their score submission history. It is the athlete’s sole responsibility to provide current, valid and truthful information in creating their account, including their date of birth and email address. Any athlete with questions or concerns about creating an account, should contact wheelwod@gmail.com. Athletes are not to create duplicate accounts. Age Requirements – Athletes must be at least 16 years old at the time they create an account on the CrossFit Games website. No athlete under the age of 16 may register to compete. 1.05 – Qualifier REGISTRATION – TERMS and WAIVERS As part of the registration process, and for all stages of the WheelWOD competition, athletes must agree, without limitation, to comply with the rules and guidelines stipulated in theWheelWOD Qualifier Rule Book, the Assumption of Risk Waiver, Publicity Release Waiver The athlete’s agreement to abide by the rules remains in force until the close of the first Open workout in 2017 or until the athlete completes a new registration for the 2017 Open, whichever occurs first, which are final and binding in all respects. 1.10 – QUALIFIER WORKOUTS – FORMAT For all workouts, the workout format will be released by WheelWOD and communicated uniformly to all athletes online. The workout format will include the following: • Required movements • Start and end ranges of the movement • Prohibited technique, accessories and/or equipment, if any • Adjustments or scaling by division, if any • Required number of repetitions and/or repetition scheme • Required equipment • Required amount of weight (NOTE: All weights will be released in pounds. It is the athlete’s responsibility to use the correct poundage. If kilogram plates are used, the athlete will need to use appropriate combinations of plates to achieve the correct poundage. Collars or clips are not to be counted in the total weight. For the purpose of competitions, 15-kg barbells will be considered to weigh 35 lb., and 20-kg barbells will be considered to weigh 45 lb. • Time domain or time limit • Scoring details – competitions may determine the winner by highest point total or lowest point total, or any method or combination of methods WheelWOD selects. Point values for finishing position will be released before the start of the workout. • Filming and submission guidelines, In all stages of competition, including the QUALIFIERS, it is the athlete’s responsibility to adhere to the workout format. This includes performing all required movements to the described standard, counting and completing all required repetitions, using the required equipment and loads, meeting the required time and meeting all submission standards. Modifying the workout format in any way is prohibited and will void an athlete’s score. Only wheelWOD. may provide official scaled versions of workouts for athletes to perform. 1.11 – QUALIFIER WORKOUTS – UNCOMMON MOVEMENT CLAUSE/RANGE OF MOTION EXCEPTIONS Any violation of the prescribed workout format, including the movement standards or range of motion, will result in the repetition(s) being disallowed. Therefore, athletes and judges should be familiar with the Uncommon Movement Clause: “Any movement deemed uncommon, out of the ordinary or used to amend, shorten or change the accepted movement standard or range of motion including line of action of any event movement can and will be disallowed. It is the responsibility of the athlete to notify WheelWOD.com of any questionable movement before the workout.” In addition, athletes should be aware that certain athletes with physical limitations in a specific range of motion may be granted an exception, in wheelWOD’s sole discretion, from performing the prescribed range of motion for the workout. This limitation in the range of motion must be due to prior physical limitations or injuries that are obvious and clearly definable by demonstration. Any limitation must be brought to the attention of wheelWOD PRIOR to the beginning of the competition. Such instances are extremely rare and will be handled on a case-by-case basis. 1.13 – QUALIFIER WORKOUTS – VALIDATING VIDEO SUBMISSIONS An athlete’s only OPTIOIN to performing an workout is to upload a video of the workout to the COMPETITONCORNER.NET website through their Competition Corner Account. Score validation for any online video submission is the sole right of WheelWOD.com. The video will be reviewed and scored by WheelWOD Appointed judges. As part of this video review process, the athlete’s posted score may be accepted, modified or REVOKED. Reasons for modification or invalidation of a score include, but are not limited to: • Failure to follow the video submission guidelines exactly • Violation of the workout format, especially movement standards • Workout attire which prevents the judge from determining if the athlete is meeting the movement standards • Miscounting repetitions Video submissions may be invalidated or adjusted without warning and after the close of a workout. Athletes submitting videos should have someone monitor their movement during the workout to ensure each repetition meets the required standards. Prior to submitting a video, athletes should review the video to ensure their reps meet the required standards, the camera angle permits the judge to determine if the movement standards are being met and there are no technical problems with the video itself. 1.14 – QUALIFYING WORKOUTS – VIDEO SUBMISSIONS – SCORING PROTOCOL There are four possible outcomes in the judging and scoring of online video submissions: • Good Video: The athlete meets the required movement standards on all repetitions in the workout and the score they posted is correct. Their score will be accepted. • Valid with Minor Penalty: Over the course of the video, the athlete demonstrates 1 to 4 “no-reps” which may be removed from the athlete’s final score as required. This penalty is used for video submissions where the score needs to be adjusted by fewer than 5 reps. If the score is posted in the form of a time, the total time to complete the workout will be adjusted accordingly. • Valid with Major Penalty: Over the course of the video, the athlete demonstrates 5 or more “no-reps.” In this case, the score may be modified by subtracting 15 percent from the total rep count. If the score is posted in the form of a time, the total time to complete the workout will be adjusted accordingly. • Invalid: Over the course of the video, the athlete fails to complete the workout as required, a significant and unacceptable number of reps performed are “no-reps” or the video does not contain the criteria listed in the video submission standards. The athlete’s score will be rejected and the video will be removed from the Competition Corner website. The athlete will have to submit a new video prior to the score submission deadline to receive a score for this workout. 1.15 – QUALIFIYING WORKOUTS – VIDEO SUBMISSION APPEALS PROCESS An athlete submitting a video for review will receive an email message from WheelWOD if the score posted with the video is modified. The message will give a brief description explaining the reason for this change in score. If the athlete disagrees with this score modification, they must contact Wheelwod@gmail.com upon receiving notification that their score has been modified. In this email, the athlete will list the workout in question, their original score, the modified score and the reason given for the score modification. The athlete will also provide a brief explanation for why they are appealing the decision. WheelWOD will review the athlete’s appeal and the video in question in order to render a final scoring decision. This decision will be communicated to the athlete by email. 1.16 – WheelWOD LEADERBOARD The WheelWOD website will host the 1 OF 2 only official Leaderboard for the Open. Athletes will be ranked on the Leaderboard based on their performance relative to other athletes in their division. Ties on the overall Leaderboard will be broken by awarding the best position to the athlete or team who has the highest result in any single workout. If athletes or teams remain tied after this first tie-breaker, the process continues to their next highest single result, and so forth. Ties will not be broken for single event results. More than one athlete or team can share an event result and all will earn the original point value. The athlete or team with the best performance across multiple workouts in a competition wins that competition. 1.33 – WheelWOD LEADERBOARD – INDIVIDUAL ATHLETES If an athlete performs a workout and submits a video submission for score validation, the entered score will appear on the Leaderboard, with the video linked to the score, once the video is submitted. Scores posted by video submission may be validated, invalidated, or modified through the assessment of a minor or major penalty. Furthermore, scores may be removed at any time at the discretion of WheelWOD.com Common reasons for adjustment and/ or removal of scores include unacceptable movement standards, improper rep counts or poor quality of video submission. Athletes in the Individual competitive divisions who submit a video ranked in the top 150 on their Open Leaderboard as of 12 p.m. EST on Saturday are guaranteed to have their video reviewed no later than 5 p.m. PT on Monday as long as there are no technical issues with the video. If an athlete skips a workout, has a workout invalidated or cannot complete the stated minimum score, they will no longer retain an overall rank on the Leaderboard. In subsequent workouts they will be listed on the Open Leaderboard below all athletes who have posted a score in every workout. This athlete will still be able to view their ranking in the specific workouts they do complete. APPENDIX A: SPORTSMANSHIP All athletes agree to compete in a sportsmanlike manner. Unsportsmanlike behavior, such as arguing with an official or representative of WheelWOD., taunting, heckling, fighting or any conduct that would bring disrepute upon WheelWOD, the competition, other competitors, or spectators or event sponsors, as determined by WheelWOD., in the eyes of the viewing public or the WheelWOD community, may be grounds for penalty, suspension, disqualification, removal from the event, disqualification from future events or legal action. All athletes agree to put forth suitable effort in every workout or event. Deliberately doing less work, or performing at a level less than one is capable of (referred to as “sandbagging”) in order to gain advantage in another workout or over another athlete or team is prohibited. Any athlete deemed by WheelWOD to be “sandbagging” may be penalized or disqualified from competition, asWheelWOD sees fit in its sole discretion. Any action that prevents another athlete from having a fair opportunity to compete (e.g., abuse or alteration of equipment, refusal to follow instruction) or that interferes with athlete and judge communication (e.g. external noise devices, bull horns, air horns, etc. ), or is generally disruptive to the event, is not allowed. Athletes will be held accountable for the behavior of their coaches, teammates, team managers, supporters and guests. If the conduct of any member of such group or groups is deemed byWheelWOD. to be unsportsmanlike or disruptive to the competition, then the coach, teammate, supporter, guest, and/or athlete is subject to the same disciplinary actions. This is not an exhaustive list and is meant as a guide for the athlete, coaches and other attendees. 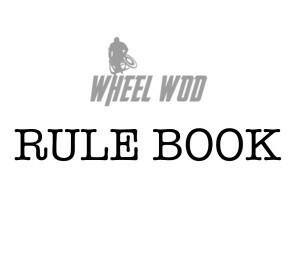 This is not intended as a limitation onWheelWOD rights to operate theWheelWODChampionships in any manner it sees fit. WheelWOD reserves the right to terminate any athlete, coach, staff, volunteer, judge, visitor, guest, supporter, teammate and/or spectator participating in, attending or viewing any sponsored, sanctioned or supportedWheelWOD Event at any time, with no further obligation or duty to such individual. All information provided, either in registration submissions, video submissions, scores, times, reps or rounds completed, must be the complete truth. A lack of integrity, or any actions that evince an intent to cheat or circumvent the rules or intent of the rules of theWheelWOD OPEN, including lying (as one example), will result in disqualification.WheelWOD has and may delegate to an on-site director the absolute authority on any final ruling including, without limitation, disqualification of an athlete, removal of spectator(s) or dismissal of any attendee.